As leaders are increasingly implementing technologies into their districts and schools, they need to understand the implications and risks of doing so. 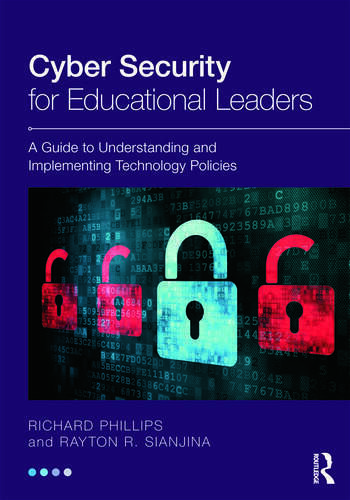 Cyber Security for Educational Leaders is a much-needed text on developing, integrating, and understanding technology policies that govern schools and districts. Based on research and best practices, this book discusses the threats associated with technology use and policies and arms aspiring and practicing leaders with the necessary tools to protect their schools and to avoid litigation. A Cyber Risk Assessment Checklist and Questionnaire helps leaders measure levels of risk in eight vital areas of technology usage. Case vignettes illuminate issues real leaders have encountered and end-of-chapter questions and activities help readers make connections to their own practice. Chapter alignment with the ELCC standards. An entire chapter on Copyright and Fair Use that prepares leaders for today’s online world. A Companion Website with additional activities, assessment rubrics, learning objectives, and PowerPoint slides. Richard Phillips is Assistant Professor and Program Coordinator of Curriculum and Instruction at Delaware State University, USA. Rayton R. Sianjina is Chair of Education, Director of Graduate Education Programs, and Professor of Education and Instructional Technology at Delaware State University, USA.